“MERS-CoV electron micrograph1” by Maureen Metcalfe/Cynthia Goldsmith/Azaibi Tamin – http://www.cdc.gov/coronavirus/mers/photos.html. Licensed under Public Domain via Wikimedia Commons. In 2012 a new virus emerged in the Middle East. Causing severe respiratory and flu-like, the disease was called Middle East Respiratory Syndrome (MERS)* or “Saudi-SARS”. 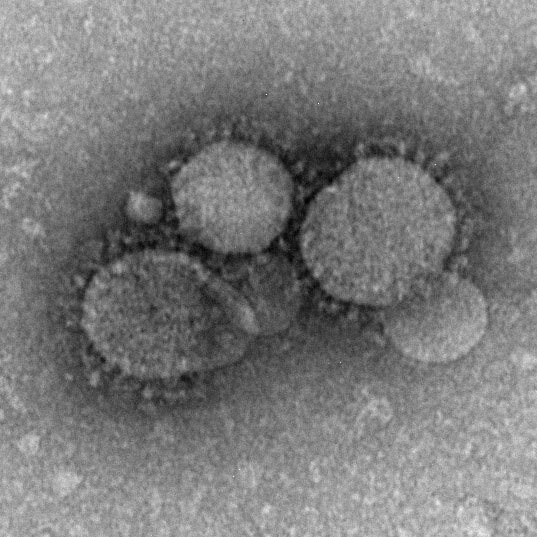 The virus responsible was found to be a novel coronavirus related to the SARS virus, and named MERS-CoV. Until recently, almost all cases have been confined to the Middle East, with some limited cases imported into other regions of the world, but with limited onward transmission. It’s thought that virus might be initially transmitted to people from camels. Since the virus emerged there have been over 1,100 laboratory-confirmed cases of infection with MERS-CoV, including at least 440 related deaths. 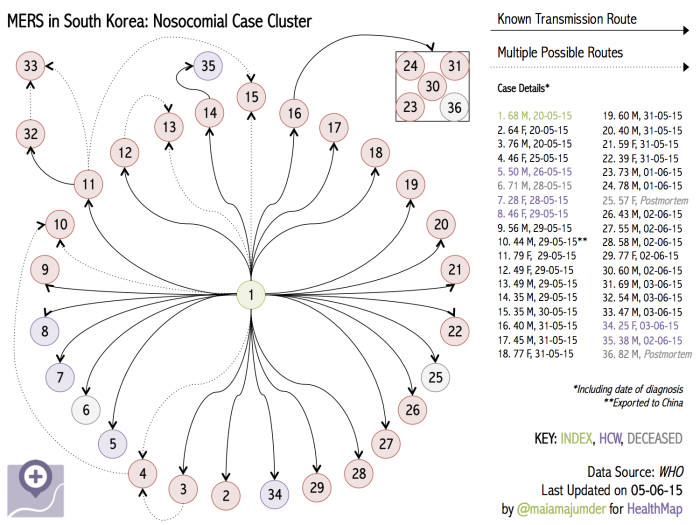 There is a very cool map of MERS cases online here but it doesn’t look like it’s been updated recently. MERS is not thought to be a particularly transmissible virus and most people are not thought to be at risk of becoming infected. The exception to this is people with underlying medical conditions, like diabetes, chronic lung disease or who are immunocompromised in some way. According to the WHO, on the 20th May, the Republic of Korea reported that they had a case of MERS in a 68 year old business man who had recently returned from 4 countries in the Middle East. According to the Wall Street Journal, the latest figures seem to be that over 60 people have been infected and 5 have died. According to media reports, the hospital at the centre of the outbreak has been closed as have over 1,000 schools. The Guardian reports that over 2,000 people are under quarantine and the government will be tracking their phones to make sure they stay at home. What seems to be a little unusual about the spread of the virus in Korea is that the index case, the 68 year old business man seems to have infected many more people than are usually infected by someone with MERS-CoV. He seems to be what’s called as a super-shedder. One theory is that he may have been producing more virus in his secretions that normal and so has transmitted the virus to more people. It’ll be interesting to know if this is because of mutations in the virus or something about the man’s immune response. There is an amazing visualisation of the first 36 cases by Maia Majumder here. It’s worth noting that this cluster involves spread of the virus in a hospital setting – so presumably amongst patients who were more susceptible to becoming infection. Saying that, some of the infected are healthcare workers. – terms that incite undue fear (e.g. unknown, fatal, epidemic). A respiratory virus – a positive-sense, single-stranded RNA virus of the coronavirus family. 2. What are the symptoms of MERS-CoV infection? Most people have a fever, cough and shortness of breathe. Some people also get gastrointestinal symptoms, so nausea, diarrhoea and vomiting. Severe complications include pneumonia and kidney failure. 3. How is MERS-CoV transmitted? The virus is spread person to person, through respiratory secretions by coughing. It’s thought very close contact is needed. 4. How is MERS treated? There is currently no vaccine for MERS, or any specific treatment except to support an infected person’s vital organs. Have incidences of MERS decreased in the last year?